Technicians are battling to stabilise a third reactor at a quake-stricken Japanese nuclear plant, after it was rocked by a second blast in three days. 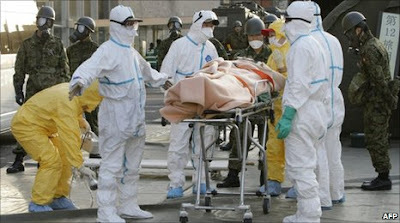 The Fukushima Daiichi plant's operators said they could not rule out a fuel rod meltdown, after a cooling system broke. They are injecting seawater into reactor 2 after its fuel rods became almost fully exposed. A cooling system breakdown preceded explosions at the plant's reactor 3 on Monday and reactor 1 on Saturday. The latest hydrogen blast injured 11 people, one of them seriously, and sent a huge column of smoke billowing into the air. The Tokyo Electric Power Company, which runs the plant, is playing down any health risk. The utility says thick containment walls shielding the reactor cores have remained intact. But the US said it had moved one of its aircraft carriers from the area after detecting low-level radiation 160km (100 miles) offshore. Tens of thousands of people have been evacuated from a 20-km exclusion zone around the Fukushima Daiichi plant.